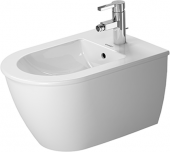 Revolution Slider Error: Slider with alias brands-duravit-darling-new-header not found. The product series Darling New is a complete bath series, to which only the right shower must be added. Harmonious circular shapes, delicate lines and transitions that can be perfected through the c-bonded technology, shape the image. The series was developed by sieger design, which also designs for WMF and Ritzenhoff. 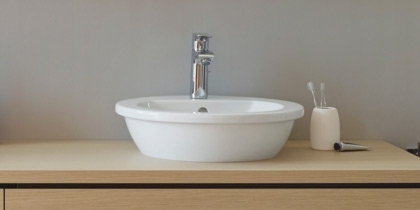 The Darling New product series includes an extensive range of furniture, including vanity units, shelves, roll-up cabinets and base units for washbasin. The furniture of the Darling New series is available in 31 colors including real wood veneers, wood finishes and paints in glossy and matte. In addition, partially bi-coloring are possible in a limited choice of colors. 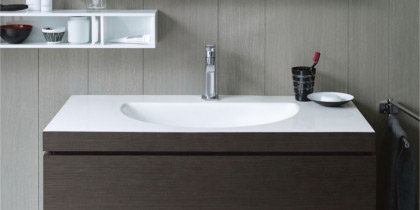 The washbasin cabinets of the series are wall-mounted and have a drawer output. In larger versions, they are equipped with glass dividers or two drawers. The length is from 500 to 1000 mm and the lower cupboards vary in width from 430 to 545 mm. So, there is the right cabinet for every bathroom and every washbasin. The tall cabinets have a wooden door with two internal glass shelves and in the middle of the cupboard a wooden shelf, so a total of four subjects emerge. With a size of 400 x 1540 mm, there is enough space to store the most important utensils. The height of the tall units is 1540 mm. Darling New offers a half-tall-cupboard format. This is 400 x 706 mm and has a height of 706 mm. The half-tall cupboard has a wooden door and two glass shelves, allowing three compartments for storing bathroom essentials arise. The upright shelves of the Darling New series are 600 mm wide and 340 mm deep. The height is 1800 mm. On one side (freely selectable) there is a mirror, which goes over the entire height of the shelf and in the width partly conceals the shelves behind it. These consist of four wooden shelves, so five compartments offer enough space. Roll containers are very convenient because they can slide in the bathroom back and forth. And you can always push them where you need them. So, you can put them, for example, as a practical storage next to your bathtub. The roll containers have a door and an inside glass bottom. The basic body has a size of 400 × 460 mm and a height of 653 mm. The mirror cabinets are also available in different sizes, so that they are readily adaptable to the washbasin. The lengths go from 600 to 1200 mm and the height of the mirror cabinets always corresponds to 800 mm. Depending on the size the cabinets have two or three doors and inside two or four glass shelves for lots of counter space. In addition, the mirror cabinets have an electrical outlet inside which you can conveniently connect your hairdryer or similar. A mounting light provides a good lighting that goes over the entire mirror front and is actuated by a sensor switch on the right bottom side. The wall boards in shelf form are fixed to the wall with an aluminum profile and are available in the colors Terra decor and white matt decor. They are available in the sizes 600 or 800 mm x 160 mm. The plates have a thickness of 16 mm. The bathroom series Darling New includes washbasins in various designs, such as tower basins (diameter 470 mm), furniture basins (530 to 1030 mm x 430 to 545 mm) and washbasins (550 to 650 mm x 480 to 550 mm). The washbasins can be combined with columns as stand or half columns. This makes the circular shape particularly effective. 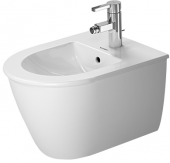 The large number of different washbasins creates a great variety of designs and a timeless look. By c-bonded technology, the washbasins can connect very well with the furniture of the series L-Cube. Thanks to the material DuraCeram, thin edges and precise transitions are created, resulting in a seamless transition and a permanent and, above all, water-resistant connection. Without the c-bonded technology and with the furniture of the Darling New series a small distance between cabinet and vanity remains, which floats the washing table visually. All the washbasins of the series are equipped with a tap and an overflow. For better care all sinks are also available with the WonderGliss glaze. The mirrors are illuminated and the lamp goes over the entire mirror front. Below the mirror can optionally have a wooden shelf. This shelf is about 5 mm on the sides, which loosens the overall optics. The lighting is switched on and off with a sensor switch and has an output power between 14 and 35 watts. All mirror configurations have a height of 800 mm, the width varies from 600 to 1500 mm. The toilets of the Darling New series are available as a stand-, wall- or back-to-wall versions. All variants are available with the rimless flush technology and bring perfect washing results without any dirty rinse. These flushes consume only 4,5 liters of water and leave a clean toilet. The hygiene glaze, which effectively kills bacteria, ensures additional cleanliness. The WCs are also available in a smaller compact version with a size of 360 x 485 mm. For the toilet seat an invisible mounting is possible. 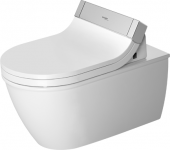 The shower toilet seat SensoWash Slim or Starck can also be used as WC seat. 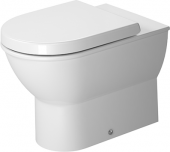 The stand-WC is available in combination with a mounted cistern or as a back-to-wall variant without cistern. Here, everything that is otherwise visible in the cistern is installed in the wall or a front wall element and becomes thus invisible. If you need a cistern, you must order it separately. 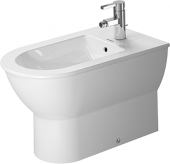 It is also available with a dual flush system, i.e. with a two-volume flush for little or a lot of water (3 or 6 liters of water). The bidets are available as stand or wall versions with tap hole and overflow. The stand bidets are available in two lengths: 630 mm and 570 mm. The stand bidets are available in two lengths: 630 mm and 570 mm. On the outside the bathtubs are square and half-round on the one side and straight and flat on the opposite side, so that you have a comfortable lying position. There is the bathtub as a built-in variant or with a wooden panel. The front wall and the corner versions have an acrylic covering. Highlight is the soft shimmering LED lighting below the surrounding rim (optional feature), which creates a particularly inviting atmosphere. Other available features include a neck cushion, sound system and a whirl system (partly also with colored light), where you can choose between four variants: Air system (only air nozzles), jet system (only water nozzles), combination system E, L and P (respectively different combinations of air and water nozzles).